Check WD0AFQ, on the tracking system, if you want to see where all we have been in the bug. Just running around town. Tonite is the GMC pinewood derby. We have some really fast looking motorhomes. I will share some of the pictures with you after the race. I will also have them posted on the GMC Photosite, where all of the other convention photos are. this is going to be fun. Mine is at home, in Mo, but I have helped get two ready for others. We have some real serious racers here. I took one to Hobby Lobby earlier to get some lead weights. Hobby Lobby carries all of the cub scout "suped up" parts for their pinewood derby cars. they will work great on our GMC coaches also. Will be back later with the pictures. Some Texan is pestering me to death, trying to buy our bug. This is the 55th convention of GMC Motorhome International. Teri and I have been members since 2006 and have attended all but one since then. We have 2 per year. Each one gets better for us. We do a lot of volunteer work for the group. We try to do whatever we see that we can help with. I especially enjoy the ice cream duties. Tonite we had another successful social. Teri and I work for Applied GMC out of Fremont, Ca. at the conventions. this company is the largest parts buisness for GMC coaches. We enjoy this also as we get to meet everyone at the conventions. The weather has been great at this convention in Pueblo, Co.Today it was long sleeve weather with lots of sun and just enough wind to make a good breeze. Tomorrow should be more of the same. The best part of these conventions, for us, is getting together with our friends that also own GMC motorhomes. Some of the greatest folks. We miss a few friends at each convention because many of our friends still work for a living and can not make every convention. We feel very fortunate to be able to make most of these get togethers. Our next gathering will be in Montgomery, Tx, in the Spring. I am anxious to make that one as we have never been to Montgomery. Have lots of photos but they are really only of interest to fellow GMCers so I have them all posted on the GMC photo site. Hope everyone is having a great week. We will be back here in a day or two. Might post some pictures of nice looking GMC coaches for you. Teri and I have been busy. We have been running around town at night. Hope to get some time to post pictures later. I do have a few on the gmc photo site for the GMC folks. We arrived without a hitch. The GMC runs like a new one. As you can see the crowds are gathering. This thing does not even start til Sunday. Ken and Lauri Burton arrived a little while ago. All shined up after the 900 mile trip. Life is good. We pullout of Dodge about 10 am and arrived here about 3 or 4pm. Can't recall. Was 250 miles today. Was a great trip. I have the best navigator a guy could ask for. teri takes very good care of me. Well, out for more pictures before it gets too cold. Herewe are pullingout of Dexter at 9 am. Oh yea, wefinally had a little sun. This was it setting. Squatters atWalmart. I could not wait to get out of here. Slides out and the truck was not attached. Levelers down and generator running all night. Ready to roll, 9 am. Dodge City, where we spent the night. Oh yea, had to make a stop here for the boss. Lets go. Ride with us. We got a great sendoff this morning. Three of our grandchildren came by to wish us well and hug our necks. Colsyn got my Mustang Poster to take home and hang in his bedroom for a while. What better car for a real cowboy to be studying than a Mustang. We took a picture for the kids. Just about ready to shove off in the morning. Have two tire senders not working so I sent Teri to Walmart for some new batteries. We finished mounting the window boxes this morning. We will pull them down when we get the others all made so we can install new upper walls and curtains of some sort. These photos do not do them justice but they really tie in well with the wall we have already replaced with wood. Here you can see the lower wall. We must now do the upper walls and headliner to finish it up. My number one helper and best friend. She had that mallet in her hand and I was "yes mam" everything she said. So, off we go, right out to the real west of Colorado. Ride with us if you have time. If not, you can check our progress by heading to the aprs map and typing in WD0AFQ-2. The little motor home will be us heading west, in the morning. Yep, just one more day and we are gone. Teri is making some curtains for the door and kitchen window right now. She has that sewing machine humming. We worked in and around the GMC all afternoon. Was dark when we finished mounting the cornaces on the driver's side. Will do the passenger side in the morning. When we get home we plan to make them for the rest of the 5 windows. Then, we will measure and order new window coverings. I'd like to have some that insulate us from the sun and the cold. The mini blinds don't do much in that area. There is a big rain storm headed this way. It is between West Plains and Springfield now. We are hoping it gets here and passes through tomorrow. Don't want to start out in the rain. We can wait til Thursday if we need to, to miss the rain. The tracker for the GMC is listed as WD0AFQ-2. I can't reprogram it right now so it will have to stay as -2 for this trip. We will be WD0AFQ when riding around in the Vdub, as we are towing it this trip. So, you are up to date on us. Ride along if you have time. I think there will be some skips in the tracker across Mo. and Ks. but it will catch up when we get close to reporting stations. We just got this picture of our grandson, Caleb. He is in Arizona and big in the county fair events. 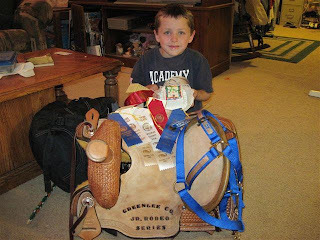 Look at this saddle he won. Wow. They live just across the street from the faigrounds and all three kids are very active in the events. Last year Teri and I worked the fair and got to see them in all of the entries. We really missed being there this year. I just wanted to share this with everyone. Caleb is 6 years old and in the first grade. Thanks for checking in. I felt this was worthy of sharing. teri and I are just about ready to roll. 2 more days and on the road we go. Colorado is looking good. The GMC seems to know he is about to take a trip. Teri has really been shining up the inside this weekend. Rylan and me pulling in from church this morning. Teri and I were blessed to have this little grandson spend the night with us last night. He will be 3 later this week. He loves riding in the bug just like the rest of the grandkids. He got to stay all by himself so he got maximum attention. It was Saturday and the drug store was closed so no ice cream. But, we did hit the local farm store where it was peanut days. We even bought a bag and brought them home. Got to sit out on the front porch and eat a few. Tyler came over and helped us for a little while. This little guy is so easy to take care of, especially when he is by himself. Teri has been slaving away in the GMC. She is cleaning before we install the new cornaces on the windows. When she starts cleaning it is a big deal, nothing gets missed. This picture is of the auxillary brake vacuum pump I installed. Been carrying it around for over a year. I used an L bracket in the back to hook it to the master cylender and clamped it in the front with a large radiator hose clamp. This is a slick mount. My good friend Gene Fisher sent me a picture of one mounted like this. I like it there. Not in the way and had to move nothing around. A perfect fit for the hatch door to close. Before installing this pump we had one pump on the brakes if the engine should die. Now, we have unlimited vacuum and brakes as long as there is 12 volts present. I like this, especially when we are out in the Rockies. The 12,000 pound motor home is not going to stop with no power brakes. This solves the problem and takes away my fear. Well, that is about it. We continue to ready everything for the trip. We are towing the vdub this trip, again. I painted the tow bar yesterday and made a couple of changes to make it easier to get on and off. Wednesday morning we will mate the two vehicles and hit the road. ride with us if you have time. We will be riding across Ks. as WD0AFQ on the tracking map. Have a good Monday, one of my favorite days. You can see here that we continue working to get the window coverings up. teri had them all glued here and sitting on the kitchen table. We had 2 grandkids here for an overnighter. Here you can see a doctor, a nurse, and one big patient. they thought I needed a checkup this morning. Here is Teri putting the finish on the cornices. Still being checked out. They said I passed but my blood pressure needed a little help and I got medicine. Clamps holding the glue until we can put the nail gun to use. Woops, that one snuck in here again. But, what better subject to have a double picture of? Teri has been hard at it for two days. We are thinking tomorrow we will screw these to the walls. Need to get them mounted in the morning as we have two grandsons spending the night with us tomorrow. Got to get our visits in with all of the local grandkids before we hit the road Wednesday. Keep your eye on the blog. We should have shots of these mounted very soon. Will hit the road Wednesday morning with the GMC and vdub. Take a look at this. I am writing the blog on this little guy. Took it with me this morning and cruised the internet while Teri built the window covers for the new curtains. Pretty neat. Picked it up yesterday at Sams Club. It has a 10 inch screen. The keyboard is almost full size. Has a 160 gig hard drive with 1 gig of ram installed. Runs on Windows XP. I like it. The wifi card is very sensitive. While at Bill's workshop I had several neighboring routers that I could choose from. I don't recommend this as a full time laptop but it sure does what I had hoped it would. Sits on the Vibe dash and will travel there, using it as a work station for the lap top. Will be great while traveling in the GMC. Here is my buddy. She is busy today. The GMC is getting a makeover and she started on it today. Our friend Bill has an excellent work shop and Teri has the keys. The old window coverings and curtains have seen better days. We are getting new ones. This has been on the list for some time. It began to happen today. A little finish work. Teri has our kitchen table covered now with wood and clamps. Holding things together til the glue dries. I think Thursday will be the day for finishing the wood work and installing them Friday. As you can see, this wall shows where one set will go. We are also putting up a new wall and ceiling but that will not happen until we get back from Pueblo. Also, the new coverings will not go on the windows until we get back. We have not picked out the blinds yet. May do Roman Shades, not sure yet. Whatever we do I want it as insulated as it can be. Gets cold during the Arizona winter nights. Teri is using a sanding block that our friend Gene Fisher gave her last year while we were at his house, in Oregon. Here he sits just waiting for the new inside makeover. As you can see I covered the wheels. Put too much work into polishing them to let them sit until we roll unprotected. I think the coach knows that we are about to pull out. I can't wait. Make sure you ride along with us. The tracker will be on. I should have more pictures tomorrow so come on back. I had one great time this weekend. One of my best friends ask me to help him drive to Palatka, Fl. and back. He had some buisness to take care of on his winter home and wanted to pick up his 27 foot enclosed trailer. The trailer was needed back here in Mo. so he can load up a few things to carry back down in Oct. Jim wanted to make a fast trip so we did. Left Dexter Friday at 4 am in his 1 ton GMC Duramax. We arrived in Palatka about 5 30 pm, 850 miles later. Was a great ride. We left last night, after church, heading on back to Mo. Was 8 pm and we arrived back in Dexter at 9 am. Great ride home but the 8 hour nap was even better, after I got home. Here are a few pictures I shot this weekend. This 1931 Ford belongs to a friend of Supreme Court Justice Clarence Thomas. Its owner purchased it 38 years ago from the original owner. It is slick with original interior. It was interesting visiting with the car's owner. He purchased one of my friend's previous homes in Florida. Jim took me by to see the place and the oner was outside so we stopped for a visit. This little fella was siting on Jim's canal bank trying to catch a mess of fish Saturday morning. Jim's present house sits on this man made canal. Pretty slick. These canals were dug in the 60s. Folks built houses on them and use the canals to get out to St John's River. An orange tree in Jim's back yard. A shot of the canal. Folks heading out to the river in their boat Saturday morning. I cut this green orange open and ate part of it. Pretty good. 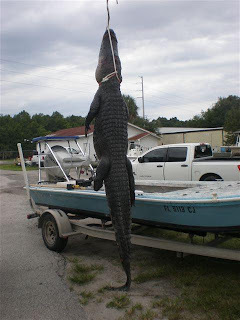 Oh yea, this is a 90 year old gator. 5 bux a pound. I was fortunate enough to meet the guy that killed this one. Serious buisness down there. I had hoped to catch a small gator on the canal to get a picture of but never saw one. This one took 2 guys 16 hours to clean. I got the full story on it. Had to get this picture to prove to Teri I was here twice Sunday, just kidding. These folks are very friendly. Hope to take Teri down to meet the Christians that gather in this building. That is pretty much it. Was a fast trip but action packed. Went looking for a used pontoon boat trailer Saturday and ended up buying a new boat and trailer. Quite an adventure. It was very humid in Florida this weekend. Just a very few minutes outside and our clothes were soaked. The air conditioning felt great. Met a lot of very nice folks. The people made the trip. My friend, Jim, is one nice guy. I am glad that he asked me to run down with him. After being up for about 27 hours the old bed felt so good this morning. We have been doing a lot of work on the GMC getting it ready for the trip to Colorado next week. I am very anxious to jump in and pull out of here next week. Stay with us and come along for the ride. Should be a great trip.